Include Access, c# 2010, VB.NET 2010, Delphi , Visual c , Visual Basic ,Visual Foxpro, Web Page Sample Code. added new PDF Decoder, now loading PDF files faster and support more PDF files. added PDFResolution property. 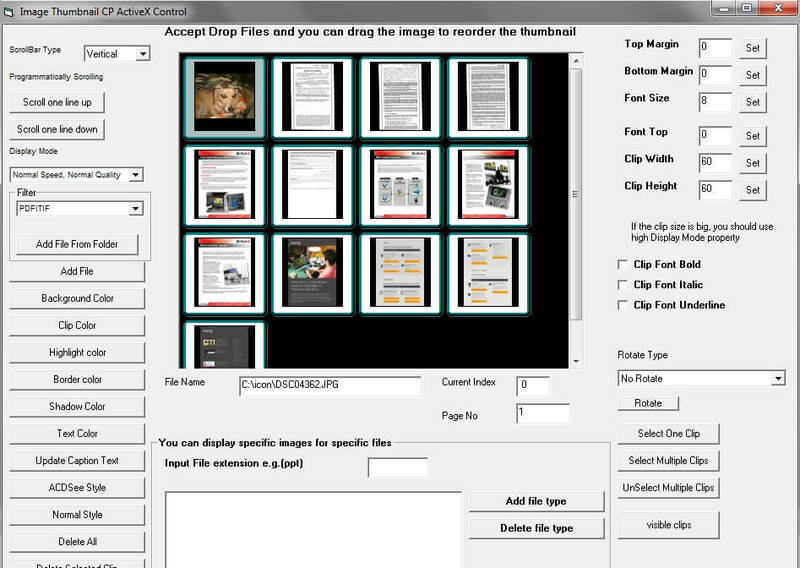 Allow adjust the PDF resolution. fixed display blank pages when loading TIFF files and some bugs. added support Windows 8 or above. updated VB6, MS Access, VFP, C# 2010, VB.NET 2010, VC samples. added return Page No in Click, ThumbnailClick, RightClick, DblClick, Left Press and Right Press event. This parameter is useful if you loading multipage PDF or TIFF file. added allow multi-selection thumbnail when press Ctrl or Shift key and then press Left or Right key. added allow use multiple wildcards when you call AddClipsFromFolder, it can filter specific image files, now loading the thumbnail faster. improved loading PDF file, decrease the loading time. added PDFRenderDPIX and PDFRenderDPIY properties. added vb.net 2010 and c#2010 sample. updated SetClip method, now support programmatically select multiple clips. Support displays thumbnails for all pages in multi-page PDF files when set LoadMultipage property = true. fixed display thumbnails for all pages in multi-page TIFF files with JPEG compression. added allow return the index of the first clip in the visible area and return the number of clips that are in the visible area. added CurrentVisibleClipCount and CurrentVisibleFirstClipIndex methods. added ThumbnailHScroll and ThumbnailVScroll events.